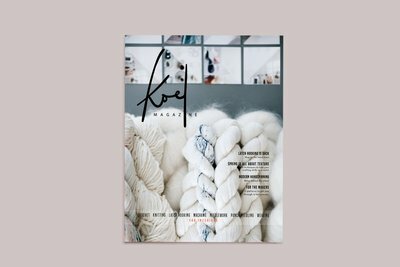 Issue 5 is all about creating maximum texture in your projects - learn stitch techniques that will bring your work to life. Hand spinning is our new passion. Take the wheel and discover how you can spruce up a modern interior with your own handspun creations. You must have heard. Punch needling is going through a marvelous revival. We speak to Arounna of Bookhou about her fascination with this craft. From Lisbon to LA, we showcase the innovative work of our favorite international fiber artists. Meet Vânia O., Camille Yang and Anne Anderson who tell us about their inspiration and dreams. We teamed up with handcraft masters Sylvia Roozeboom and Monique Dijkman to unlock the secrets of the brioche stitch and Wayuu patterns. Get ready to delve into colorful and lush tapestry, macramé wall art, miniature needlework and much more. We introduce you to our KOEL Whites, a series of handpicked white and off-white yarns. Natural beauties, plain and simple. Our spring latch hook design is super shaggy. Continue your never-ending love affair with this free-spirited craft. We have curated 11 exclusive patterns to keep you busy for months. Brace yourself as we have many, many cushions for you to make.